CCS Software Envelope - Ultra Tax 1st Class 80554 -- Order Tax forms Online, buy W2 Forms, W3 Forms, 1099 forms, 1096 forms, 1098 forms etc. 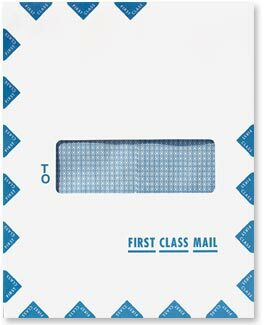 Use this single window envelope to easily mail any tax return or report from UltraTax software. A blue interior tint adds security while the cellophane window allows the "To" address to clearly show through. This 9 1/2" x 12" envelope is designed for compatability with UltraTax Software by Creative Solutions but can work for any customized application.